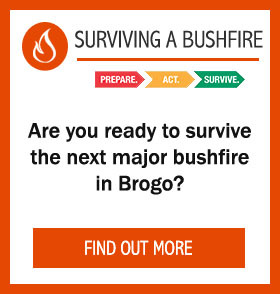 Welcome to the Brogo RFB area of the Brogo community website. 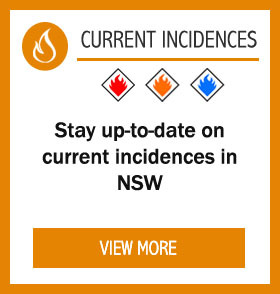 For general information on Total Fire Bans please click here. For your survival, leaving early is the only option. 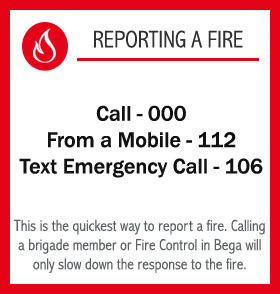 Leave bush fire prone areas the night before or early in the day – do not just wait and see what happens. Make a decision about when you will leave, where you will go, how you will get there and when you will return. Homes are not designed to withstand fires in catastrophic conditions so you should leave early. Leaving early is the safest option for your survival. If you are not prepared to the highest level, leave early in the day. Only consider staying if you are prepared to the highest level – such as your home is specially designed, constructed or modified, and situated to withstand a fire, you are well prepared and can actively defend it if a fire starts. Well prepared homes that are actively defended can provide safety – but only stay if you are physically and mentally prepared to defend in these conditions. If you're not prepared, leave early in the day. 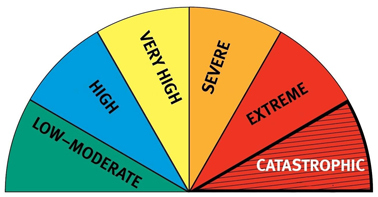 Review your bush fire survival plan with your family. Keep yourself informed and monitor conditions. Be ready to act if necessary. You may require a Fire Permit and a Bush Fire Hazard Reduction Certificate before you light a fire. Click here for more details and the current Permit Officers.